Guam is an island in the North Pacific Ocean, and it is the largest in the Mariana Islands archipelago. It is US territory, and it has a strategic location. As far as tourism goes, just like any other island in the Pacific, Guam welcomes its tourists with whatever it has best to offer. You can relax on Gun Beach if you wish and take a bath in the ocean, or you can explore the island. The choice is yours. One of the things you will like in Guam is the night markets. Plenty of tourists go there, and when the night markets are open, the restaurants and shops actually charge more for their service. Another thing you will like is the food, but you cannot miss the barbecue. The people of Guam are actually very proud of their grilling skills. Before you travel to Guam, you need to check and see if you need a visa. However, just because Guam is US territory, it does not mean it follows the same visa policy. In fact, Guam, the Northern Mariana Islands, and American Samoa have their own policies. Basically, the citizens of countries that are visa exempt, as well as the nationals of the states in the visa waiver program are kept, but Guam has an additional visa waiver program that allows eligible nationalities to travel to Guam for up to 45 days without obtaining a visa or an ESTA. All the other nationalities who are not visa exempt or in the visa waiver program must apply for a visa at the nearest US embassy. One aspect that should be mentioned is that all travelers who arrive in Guam without obtaining a visa must complete an I-736 form for each trip. That can be done online. 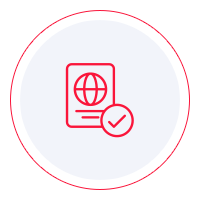 If you want to find out whether or not you need a visa, you should use iVisa’s Visa Checker. It is fast and convenient. All you have to do is click on the Visa Checker button you see in the top right corner and fill in the boxes. You must select your nationality from the drag-down menu on the left, and on the right, you must choose Guam as your destination. The result will tell you if you need a visa or not, and if you do, you will be given some useful information such as a list of the nearest embassies where you can apply. iVisa cannot help you get your visa for Guam, but it can provide you with valuable information. If you have any questions regarding the application process, you can call our support service. It is available 24/7 and is free of charge. As far as the requirements go, you need to know what they are so that you can meet them. You can find a lot of information online, but we advise you to use it as a reference only. The info you see online is not always the most reliable. Plus, the US visa policy is not the easiest to understand. Consequently, we recommend that you call the diplomatic mission of the United States and ask your questions there. They can give you the most legitimate answers. Meanwhile, what we can tell you is that travelers who take a trip to Guam need to have a passport that does not expire for at least another 6 months from the date of arrival.